Math Confidence by Robin the Math Lady | Build Math Confidence! Robin is a mother, teacher, and an educator. She was trained as an electrical engineer and has a Master’s degree in Business Administration. The constant in her life has been a love of math. Her father, a physicist and educator, always encouraged her to pursue STEM, even though she was a girl. Girls back in the 70’s weren’t supposed to go into science or engineering. When she worked in other careers (electronics and finance), her heart was in training and teaching. Later, as a mother, she saw a need for really good math instruction and wanted to help teachers prepare all children with an excellent mathematical background. Math Confidence’s name was inspired by a local newspaper ad “Overcome Math Anxiety” which kindled the phrase “Build Math Confidence”. Her mission is to help people build confidence through Math — whether one-on-one, in her own classroom, visiting other classrooms or in workshops. Robin has been tutoring Math since 2000 and has worked with students of many ages, abilities and interest levels. She shares her excitement for Math and learning during sessions helping students to enjoy the process. She also has 16 years of classroom teaching experience plus 11 years of teacher training including coaching/mentoring working and student teachers. She works with teachers one on one and in groups through professional development workshops and holds classes for parents. In 2018, she was approved as a New York State CTLE (Continuing Teacher and Leader Education) Sponsor and offers CTLE credits. Robin is “pro-test” and take tests for the fun of it: SAT (2019, 2016, 2009 and 1980), ACT (2012), and SAT Math II Levels 1 and 2 (2011). These recent exams help her to relive studying and test taking, fill gaps in her education, and relate better to students’ experiences. Here is the link to her NYT Robin’s Letter to the Editor about SAT and exercising our minds. Robin is involved in the Math education community through her role as VP/Conference Coordinator for the Association of Teachers of Math of New York City and as the New York City rep for the New York State Association of Math Supervisors. She writes regularly for the National Council of Supervisors of Mathematics newsletter and has been e-publishing her own Build Math Confidence e-newsletter since June 2008. 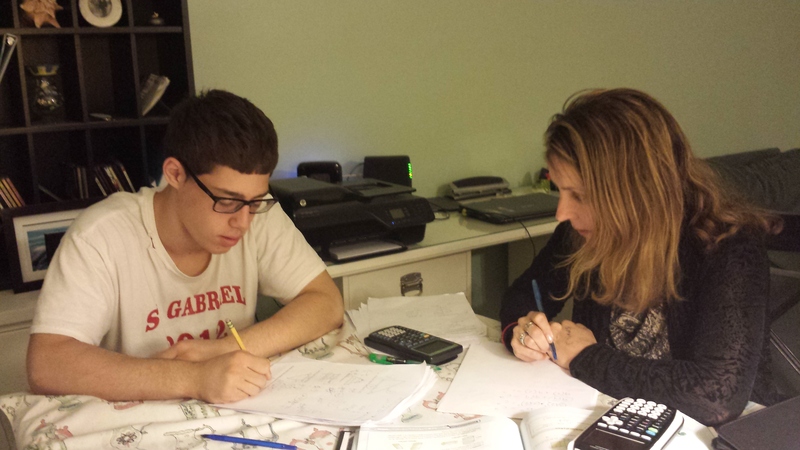 Robin tutors Math at all levels including SAT/ACT prep, SHSAT, homework help, Regents/exam studying as well as college/grad school classes and homeschoolers. Based in Riverdale (Bronx), New York, she has worked with students from Bronx Science, High School of Math Science and Engineering, Riverdale Kingsbridge Academy, Horace Mann, SAR, Bank Street, Beacon, High School of American Studies, PS 81, Community School, Solomon Schechter, Aaron School, Heschel, Riverdale Country Day, Baruch College and many many others. Since 2002, Robin has brought her enthusiasm and drive to the classroom as an Adjunct Professor at the College of Mount Saint Vincent in the Bronx teaching Precalculus, Math Modeling (College Algebra) and/or Math for Elementary Educators. As a Field Supervisor for Math Education undergraduate and graduate programs in and around NYC, she mentors and observes student and working teachers for CMSV, Touro College, NYU and Teachers College/Columbia University in many middle and high public NYC schools as well as parochial schools. She supports current classroom Math teachers with curriculum development and learning strategies in real time in classrooms in NYC (and beyond!) as well as provide workshops on learning and teaching Math. For 5 years, Robin taught SAT Math classes for Summer on the Hill, a year-round academic enrichment program for bright, low-income New York City students. Workshops for Parents, Teachers and Students: A blend of Math and motivation! Get Smarter! Take the (new) SAT! Her credentials include Math intensive fields Electrical Engineering (BS, Syracuse) and Finance (MBA, NYU) as well as Stuyvesant High School. Starting back in engineering school study groups, she was teaching friends Math (while they taught her Science!) and the potential for joy of the ‘aha’ kept us working on problem sets well into the wee hours of the morning. To round out her education, she also has certificates from NYU in Coaching and Training as well as certificates from New Visions for Public Schools in Supporting the Next Generation: Effective Mentoring and Coaching the New Teacher and Structured Inquiry: Making Math Come Alive for the Adolescent Learner. After working on Wall Street and in the high-tech field of electronics, she went back to her first love, Math! This was foreshadowed in ’96, by correctly and creatively answering a (third round!) Finance job interview question: “What’s 24 x 12?”.